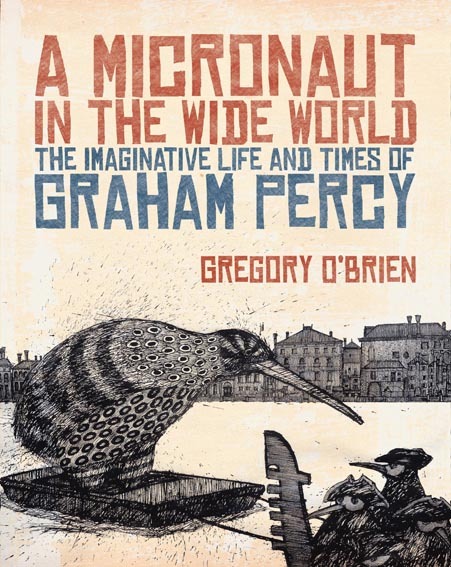 A Micronaut in the Wide World: the Imaginative Life and Times of Graham Percy, by Gregory O’Brien, (Auckland University Press, 2011), 182 pp., $59.99. Imagination, and all its mighty power, is at the centre of both of these recent Gregory O’Brien publications. It is no coincidence that both titles have the eyes and minds of children at their core, yet in both cases O’Brien’s writing elevates imagination beyond its usual youthful collocation. Back and Beyond is written, as the title suggests, for more innocent art readers, while Micronaut is a biography of New Zealand expatriate artist and children’s illustrator Graham Percy. The challenges inherent in writing art books for children are manifold. It’s easy to patronise, and just as easy to aim too low and miss anything worth saying. O’Brien addresses this problem in both the structure and style of Back and Beyond. Using the first person, O’Brien adopts a considered conversational tone to describe many of the paintings. While shunned in some circles, there is something to be said for the well-timed invocation of the personal in art historical discourse. If gallery wall texts were written from the point of view of an individual and situated as but one voice in a multitude of voices there would necessarily be more room for disagreement and for the initiation of conversations so vital in any pedagogic scenario. Similarly, by presenting a collection of painters’ profiles and selected works under loosely thematic titles, each of which takes up two pages, Back and Beyond remains open for narrative interpretation. The focus on individual painters operating within particular social and historical contexts presents a personal, and therefore accessible, account of painting in New Zealand. This structure allows the book to be dipped into and threaded together in its varying ways rather than read through and unconsciously digested. The scattered format also ties in with O’Brien’s framing of New Zealand painting as being characterised by ‘poozling’ and journeying. ‘Poozling’ – according to O’Brien – is a slang word native to Aotearoa that means the salvaging and collecting of things to use in other places – seems to be a child-friendly version of appropriation. Raising this idea early in the book, O’Brien cleverly introduces painting’s often self-referential nature, as well as establishing a framework for negotiating cultural overlaps and intersections. He touches on colonial and post-colonial politics, but in the main explores the folksier side of New Zealand painting, focusing on narrative veins of Maori myth and on the arrival and consequent development of European representational and figurative painting. Back and Beyond is not a history of New Zealand painting, and it does not claim to be; but more attention to abstraction and its proponents would have been, rewarding strategy for broadening understanding. However, its rigour as an instructive text is confirmed by the inclusion of a comprehensive biographical section, along with a recommended reading list for many of the artists featured. An engaging activity page is also included; this challenges children to create their own version of Frances Hodgkins’ ‘Cherished Things’ — all part of O’Brien’s worthwhile attempt to coax the imaginative faculty forth in his readers with the hope of altering their aesthetic approach to the everyday, and thus cultivating a more alert way of seeing amongst the young and curious. The act of drawing as a method for perceiving one world and creating entire other worlds is the basis for O’Brien’s biography of Graham Percy. Percy attended Elam and after graduating was a constant and exceptional contributor to the New Zealand School Journal, as well as an accomplished graphic designer who worked on book designs with writer Bruce Mason and on exhibition catalogues for Colin McCahon and the Ikon gallery artists. In 1964, Percy moved to London to take up a Queen Elizabeth scholarship at the Royal College of Art. In A Micronaut in the Wide World O’Brien uses Percy’s Le Corbusier-esque townhouse in Wimbledon and its contents as a metaphor for Percy’s immersive love of building worlds within worlds, of exploring life’s minute details. O’Brien wrote the book in Percy’s home in the months immediately following his death in 2008, surrounded by the objects and art that Percy and wife Mari Mahr cherished. The loosely chronological account is heavily influenced by O’Brien’s interactions with Percy’s drawings and paraphernalia – as if O’Brien is conversing with Percy via these items. The book, divided into mini-chapters, takes the form of a modernist work of literature, which one feels Percy, a lover of the gently surreal, would have appreciated. Approximately half of the book is devoted to Percy’s independent work created after the millennium, a decision that allows greater exploration of his formative experiences and unique inclinations as an artist. Rather than dwelling on Percy as a commissions-based illustrator, O’Brien argues an extremely convincing case for greater attention to be paid towards later bodies of work that include: ‘Arthouse’, ‘Imagined Histories’, ‘the Kiwi’, and ‘Alchemical Allotment’. These nuanced and intelligent series form the majority of the current touring exhibition curated by O’Brien. The inclusion of most of the plates means the book can easily stand alone as a comprehensive visual record of Percy’s career. More than an article of pure documentation, A Micronaut in the Wide World is steeped in genuine humour. O’Brien’s light touch reflects the artist’s sanguine nature, infusing many of Percy’s life’s moments with an optimistic levity: beginning with his upbringing in the town of Stratford – complete with its surreal Shakespearean aspirations – his work within the Hungarian animated film industry and even in the recollection of Percy’s manner of dealing with the medical problems that affected him — first his colour blindness, then his series of strokes later in life. The book is an affirmation of the value of drawing, of travel, and of course of the imagination. O’Brien’s description of Percy and Mahr’s art as a type that ‘has a rare capacity to accommodate innocence and wonder without excluding knowledge, history and intelligence’ could equally be applied to both Back and Beyond and A Micronaut in the Wide World. JAMIE HANTON is a visual arts writer and curator hailing from Christchurch. He is currently the Director of The Blue Oyster Art Project Space in Dunedin. Towards a Promised Land: On the Life and Art of Colin McCahon is of Colin McCahon’s ‘A Painting for Uncle Frank’, a late work (1980) containing (written in white paint over a black background) a quotation from the New English Bible’s Book of Ecclesiastes, which includes the words ‘Those who refuse to hear the oracle speaking on earth find no escape.’ McCahon met Uncle Frank a number of times during the late 1930s and early 1940s at Toss Woollaston’s house in Motueka, and was fascinated by Uncle Frank’s ‘teaching aids’: his naïve paintings of simple Christian symbols, part of his itinerant preaching paraphernalia which he insisted on pinning to the walls of Toss Woollaston’s home whenever he was visiting, much to his nephew’s irritation. If you could physically sense an author’s passion and thoroughness, Peter Simpson’s books would glow like fresh bread. His timely and lavishly illustrated Fantastica: The World of Leo Bensemann positively radiates, and yet again shows Auckland University Press to be New Zealand’s pre-eminent art book publisher. Artist and illustrator Bensemann was the descendent of North German immigrants from Bruchhausen-Vilsen south of Bremen, settling at Moutere, and was born in Takaka in 1912. His family moved to Nelson in the early 1920s, and that dramatic karst landscape was to become a reoccurring feature in his rich oeuvre. The German influence was also strong, manifesting in a rich vein of Romanticism in his work, embracing Holbein and Dürer, and various Medieval, folk, and expressionist sources, to complement the vivid orientalism of his drawings and landscapes. Outside of Canterbury Bensemann has not been well known beyond the influential Ilam mafia and the occasional reproduction in magazines in the 1940s and 1950s, though his portraits were reproduced annually in the New Zealand Arts Year Books from 1946 until 1949, and during his lifetime one article in Landfall in 1953, and a memorial in Art New Zealand shortly after his death in 1986. Since then, there have been two publications by Bensemann’s daughter Caroline Otto and at least two significant exhibitions curated by Simpson. For someone described by his publisher as a ‘towering figure in New Zealand literature’ – a description the author would probably endorse – one approaches the memoir of his youth with expectations of discovering the magical springs of his inspiration or, to the contrary, a story of childhood deprivation and loss that fuelled his high ambition and achievement. The surprise is that C.K. ‘Karl’ Stead’s youth was rooted so firmly in the conventional and prosaic, within such a limited familial and environmental reach, that its narration, at times, becomes simply mundane. We must wait until Stead reaches university before the narrative becomes truly engaging; and therein lies the tale.